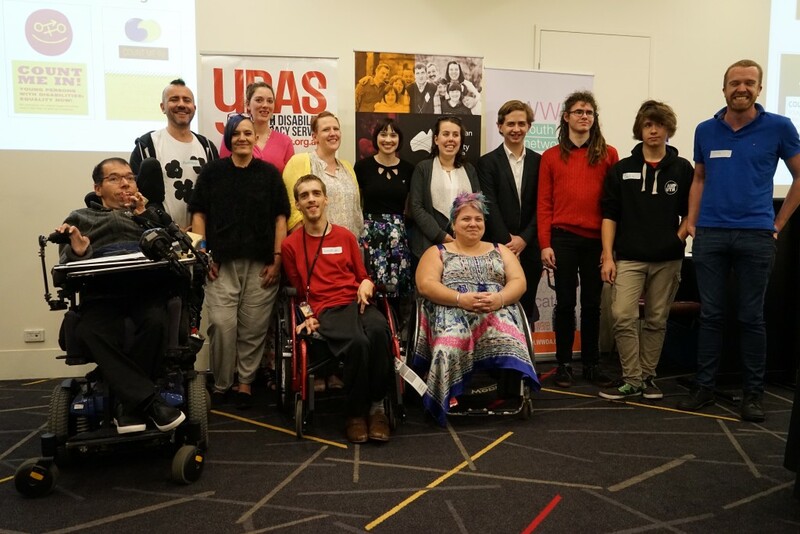 In November 2015, the Australian Cross Disability Alliance (ACDA) in collaboration with the Women with Disabilities Australia Youth Network (WWDAYouth), and the Victorian Youth Disability Advocacy Service (YDAS), hosted a national forum of young people with disability on the theme of sexual and reproductive rights. The Youth with Disability National Forum was held as part of an exciting and innovative global project being established by the United Nations, to improve the human rights of young people with disability worldwide – particularly their sexual and reproductive rights and their right to freedom from violence. From L to R: George Taleporos, Matthew Bowden, Carolyn Frohmader, Kalena, Jonathan, Bonnie, Cashelle Dunn, Charlotte, Amy, Brendan, Ryan, Jade, Christopher Brophy. Not pictured: Margherita Coppolino, Amorette, Ariane, Georgia, Daye. The global project is being coordinated and implemented by the United Nations Population Fund (UNFPA) with support from Family Care International (FCI), and has been funded by the Spanish Agency for International Development Cooperation (AECID). It is currently in the establishment phase and the Australian Cross Disability Alliance (ACDA) has been working with the UNFPA and FCI to provide expert advice and assistance to set up and implement the Project, which is expected to run for four years. Part of the planning and establishment phase of the global project includes developing the promotional campaign for the entire project. This includes for example, developing logos, slogans, branding and campaign messages that will be used throughout the four year project. In providing expertise and advice to UNFPA and FCI, the ACDA recommended that young people with disability be centrally involved in the design of all elements of the global promotional campaign for the global project. UNFPA and FCI offered to support the ACDA to host a National Forum of young people with disability in Australia to contribute their ideas, suggestions, views and feedback on the draft global promotional campaign for the project, and also to consult and engage with them on the theme of sexual and reproductive rights – which forms a priority focus of the global project.